A very accurate and delicious profile of Watermelon Jolly Ranchers. Woah! This is phenomenally good! 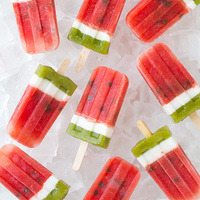 If you like watermelon candy you will like this recipe! It is excellent, def. in my top 10. Minty, watermelon hard candy. Very good. Haven't had the original so can't comment on it as a clone. I've also mixed a version with FW Grape and FW Watermelon in place of the FW Jungle Juice which came out quite nice for a reduced menthol version. This is good stuff. I expected that Hard Candy to hit me like a brick sack of potatoes, but it's actually layered into the recipe really well. It isn't off-putting whatsoever. I never use menthol or koolada, however mint does fit this profile so perfectly. The sweet and candied Watermelon is right up front. Jungle Juice and Hard Candy give it those weird sugary notes. Pretty spot on watermelon candy to me. Thanks for sharing! FW Hard Candy and Jungle Juice are two flavors I can pick out in any mix to it's detriment. I don't know how you managed to make them taste so damn good here, but you did. This is some sweet, juicy, cool watermelon candy deliciousness right here. Right out of the gate, 2 hours after mixing it is stunning. All I taste is candy watermelon, nice cool watermelon exhale with a pure fresh watermelon candy inhale. The aftertaste is unreal too! This is a must try if you got the ingredients! Thanks so much for sharing this with us! Can i up the la watermelon to 11-12% if i dont have fw watermelon? Never tried original. Tried a day after mix, LA gave me a nasty floral taste and I almost threw it out. I gave 10ml each to two friends to try and they loved it. So after 3 weeks I still had almost 10ml left and tried again. Floral is practically gone and tastes awesome. I have problems with a lot of fruit flavors being floral, I have yet to find a strawberry I can vape and I have tried all the typical brands. This is not exact but it is pretty damn close and totally awesome. I am enjoying it the most after 2 weeks. Great job Vurve and thanks for your hard work on this! Awesome clone Vurve! Watermelon Crack was one of my fav B-X juices. if i wanted more of a menthol kick what could i add without totally destroying the overall flavor? this is a ADV for me. This is SPOT ON! Awesome job dude! I havent tried bx watermelon crack so i dont know how accurate this is to the original but it is freaking delicious.